One of the best deals on the beach! Location Location Location! There are a lot of options when it comes to planning where to stay on a Savannah vacation. You can stay right downtown or you can escape from the crowds a bit and book Tybee vacation rentals for your stay. Tybee Island is a serene barrier island only 30 minutes from downtown Savannah. It has beautiful sandy beaches and a quiet island charm that makes for a perfectly relaxing vacation. If you decide to consider vacation rentals Tybee Island, then you won't have to look any further than the selection offered by Southern Belle. We offer many beachfront Tybee Island vacation homes as well as those only a short walk from the beach. The property at Benton Cottage is one of our roomier Tybee vacation rentals with four bedrooms and four and a half bathrooms. Only 100 feet to the beach, this property can sleep up to nine guests. It's one of our perfect vacation rentals Tybee Island for a large family or two families vacationing together. 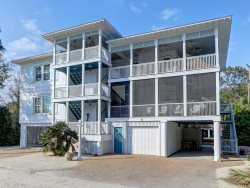 Like all of our Tybee Island vacation homes, this property features a ton of great amenities. You'll find one king bedroom, one queen bedroom, one bedroom with two single beds, another bedrooms with three singles, a dishwasher, laundry in unit, large screened porch, lots of outdoor seating, private parking, multiple large flat-screen TVs with cable and a free wireless Internet connection. This house also offers four full bathrooms and one half bathroom for the convenience of larger groups. When you approach this house, the first thing you'll see is the huge porch with tons of seating and screens for privacy. Inside you'll find charming nautical decor with shades of light green and blue to reflect the island location. A living and dining area are not far from the large sunny kitchen. Here you'll find plenty of counter space and all modern appliances. The king bedroom has a distinct tropical feel with wood floors, walls and ceilings and art with palm trees. The other bedrooms also have their own unique decor like sea foam green and palm trees. You'll really feel like you're staying in a beautiful tropical location. Beneath the house is where you'll find the laundry units as well as a large private area to sit and relax. This house is huge and has everything you need for a great group vacation. You won't have any difficulty finding things to do near your Tybee vacation rentals. Many are located just steps from the beach and there are plenty of services within easy walking distance. Another benefit of staying at vacation rentals Tybee Island is the short half-hour drive to downtown Savannah. You can easily choose to spend a relaxing day on the beach not far from your Tybee Island vacation homes, or spend an exciting, full day in downtown Savannah. Starting with Tybee Island, probably the first thing you'll want to do is spend some time on the beach. After that, the top attraction is the Tybee Lighthouse and Museum. At only 2.7 square miles, Tybee Island offers great ease in getting around and seeing a variety of things in a short time. At the Tybee Lighthouse, you can climb to the top to get an amazing panoramic view of the island. If you or anyone in your group loves history and the Civil War, then you can't miss a visit to Fort Pulaski. The fort offers guided tours as well as demonstrations of old weapons like muskets and cannons. Everyone loves dolphins right? Tybee Island offers fun-filled dolphin tours to see the wild bottlenose dolphins swimming the waters around the island. Captain Mike's Dolphin Tours and Captain Derek's Tybee Dolphin Adventure are two popular charters that also offer other boat tour services. If you want to learn more about the island's ecology and explore the sea turtle project, then you can't miss a visit to the Tybee Island Marine Science Center. The center offers beach walks and features an aquatic display. There are also plenty of opportunities to rent equipment and venture out on your own. You can rent bicycles, jet skis, kayaks and surf boards. There are a variety of restaurants on Tybee Island and two popular places include the Crab Shack and the Tybee Island Social Club. The Social Club offers brunch with Latin-infused cuisine in a charming white bungalow. You could easily fill a Tybee Island stay with activities just on the island, but if you have extra time, make sure to visit Savannah and take in historic River Street, Forsyth Park and even more opportunities for shopping and dining. Savannah also sees a variety of special events throughout the year from ethnic cultural festivals to music festivals and more. Just ask us for a full list of what might be going on during your stay. Come see why Southern Belle's Tybee vacation rentals are the best in town. Our vacation rentals Tybee Island offer idyllic locations and impeccable amenities. Tybee Island vacation homes provide a relaxing home away from home that still puts you within a short distance of all the popular sights. Give us a call to book yours today. The the young lady at check-in is very helpful and informative. The house was so nice and clean. The decor was beautiful and it was a cozy cottage. Plenty of room for myself and all my grandchildren and daughters.